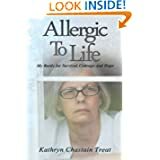 This entry was posted in Allergic to Life: My Battle for Survival, Allergies and Sensitivities, Body, Chronic Illness and Treatment, Environmental Illness, Food Allergies, Multiple Chemical Sensitivity, Reactions, Toxic Free Living, Uncategorized and tagged allergic to life, chemical sensitivity, dangers of chemicals, environmental illness, Nose blind, V. Bookmark the permalink. Great point. I had one friend who didn’t know she reacted to chemicals until she gave them up for me. She had been constantly reacting so that was her normal then we she detoxed she realized it wasn’t normal at all. That explains it so well. It is interesting to see how sensitive to smells people who know me have become. They aren’t sensitive to the chemicals but they now prefer fragrance free. I think the smells are like white noise – until the power goes out and all the noises stop, we don’t realize how much noise is around us. Until we are in a fragrance free environment and clear our sinuses, we don’t realize that we have been tuning out all those smells. Stephanie, that is so true. I have a friend who soon realized that the laundry soap she was using was the cause of headaches. My husband, while not as aware as I am of chemicals and those that have a smell, senses things much more strongly after living without all that stuff. I have a follow-up post that I am working on. It most likely won’t happen until after the New Year. I am behind on my Christmas projects. Oh good! (not about being behind, but the follow up post) That means I don’t have to 😀 I can just play with making a meme or 2 instead. And then link to your posts.